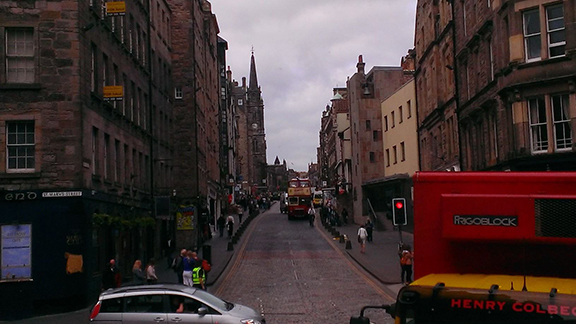 Edinburgh is an old, hilly city with narrow streets and narrower closes. In the early mornings of summer the sun rises around five and paints the buildings pink and gold. There is no one on the streets. It is so quiet that you can hear a bus rumble its way down Easter Street. The buildings are a mix of stone and brick with grey shingles. The air is soft and slightly damp – it rains often. By Edinburgh castle if you look North you can see the parks spread below, the tree tall and shadowy in the morning light. The closes are like thin snakes that have stairs that trip crooked up and down narrow hills. Edinburgh has a large shopping district on Princess Street, complete with an underground mall, but some of the best places are in the back streets. 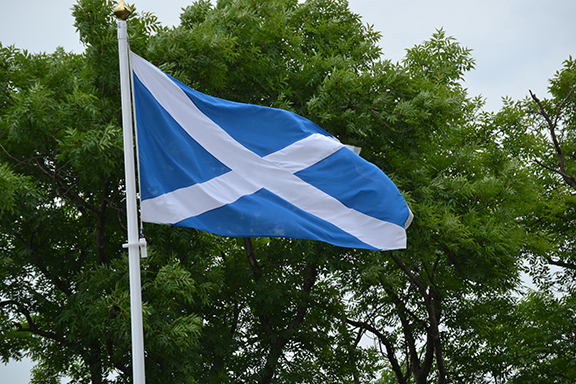 Scotland had a long history in the wool and textile industry. In fact, there are two sheep for every person in Scotland (roughly ten million). This makes for a very affordable region to get some of the best knitwear on the planet. There are local shops that specialize in wool and knitwear. One I consider highly is Ragamuffin, a local shop on the Royal Mile with the best collection of knitwear I could find. The inside is cozy but well organized, and the offerings are top quality from all around Great Britain and Ireland. Because of the quality, they hold up well and keep the wind off you back! The outside is painted white with blue letters. Old glass is set in the windows, the kind with circle distortions made while it was blown. Plaid is the next thing. It’s also called tartan, which refers to the fabric itself or the pattern. Sett is the term for a pattern that is created using right angles. It used to denote your family or clan or region, and today is still in use for formal events, tourists, and Iru-Bru bottles. There are hundreds of plaids due to the amount of variation and personal preference. This is much easier to find a personal one if you are of Scots decent. Tartan is made of woven wool. It’s quite comfortable and pleasing to look at. Iru-Bru is a special kind of drink in many ways; its color, its taste, its ability to hold neck and neck with Coke, and some of the cleverest marketing in the country. Edinburgh is an old town, with parks off almost every street. The best walk, I think, is from the train station up to Saint Margaret’s Episcopal Church, by Sunnyside. At a brisk pace it takes fifteen minutes, and the buildings are beautiful. It’s more fun to take the indirect route, cutting though side streets with cobble stones and heavy arches. That’ll take you past Regents Park, which is quite lovely in the morning. If you continue you’ll hit Albion which will lead you to Lochend Park. 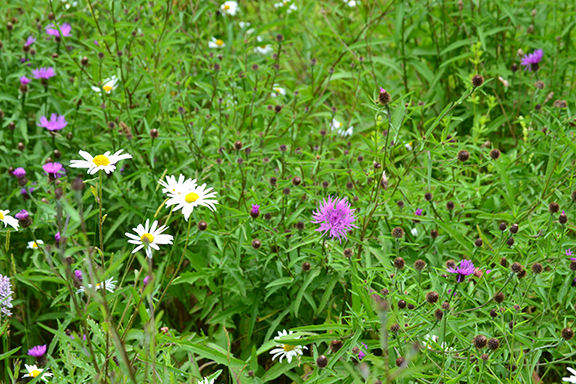 The loch is busting with wildlife and there are a few nature trails. At dusk th bids come in for the night. They rest on the grass and the whole place is quiet. Edinbrugh is the perfect walking city. If you’re up for it, double back to the castle and get and pint at The World’s End. Copper cobbles on the street mark where the city ended in the 16th century. 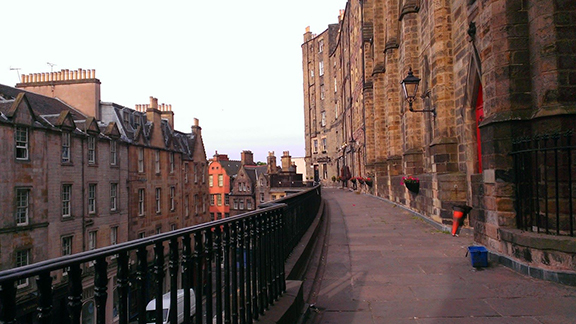 With an incredible mix of modern and historic, Edinburgh is a place not just to visit. Go tour a castle, or watch a sheep herding demonstration. Eat haggis and haddock and drink whisky. Author BIO: Moria is a university student. She likes to travel and experience fashion first hand. Her passions are photography, historical art, and languages. Most of her publications are nonfiction research based work. You can follow her on Twitter: @Halls_of_Durin and view her photography here. Moria is one of our blog contributors highlighting everything from travel to PLIA Designs designer handbags.